Text Twist and Super Text Twist are the word game by Yahoo games which can be played online as well as downloaded to be played offline. 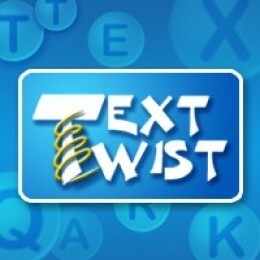 Text twist is a word game in which you have to make words out of 6 given letters in a limited time. This is quite challenging. Yahoo games always produces very nice games and this is one of them. Challenging yet you can have fun. Text twist can be played online on Yahoo games. It's very easy to play. It also helps in increasing your vocabulary. However, the limited time is quite annoying and you might get bored by playing it over and again. The offline version comes with more additional features but you have to pay some bucks for it. If you like the game then it's not a problem. The objective of text twist game is very simple. Some letters will be given to you and you have to make all words out of those letters. The total letters given is 6. There is a certain limit that how many words you can make out of those 6 letters. The time limit is 2 minutes so you have to scratch your head to make words to proceed to the next level. If you are well above then the computer will take you to the next level. There is twist button which you can click. This twist button rearranges the all letters so that you can see more letters out of them. Certainly there is a single longest word and if you figure it out, you will proceed to the next level of text twist easily. There is an enhanced version of this game called as Super Text Twist which contains seven letters. This games is almost same. Overall they both are spelling games and you have to make words. It will basically increase your level of vocabulary and thinking. It is also very helpful for kids. By playing this they will come to know about many words and must part is that their thinking ability will increase. At last you can check your score to match with all the people how good are you playing this text twist game. I prefer to play web version of the game which you can play online on Yahoo. I think it's sufficient more than enough. Give it a try and share your experience here. TextTwist games is most favorite on this present time and your description is look attractive and hope it'll helps me more to enjoy text twist games on my free time. This not only gives you an easy way to compare pricing, but it gives you a fast way to access multiple sites that sell the item you are looking to buy. These sites can also be great if you have a generic idea of what you are looking for but don't yet know the exact item.